When I work on Yupo, I get lots of questions about the process. After all, Yupo has a slick synthetic surface completely different from the usual look and feel of watercolor papers such as Arches. Thanks to the wonderful teachers I have encountered along the way and the growth of the Yupo market, my journey in experimental work has grown and expanded. The more I learn about working on Yupo, the more I enjoy the process. "I Love Yupo" is the title of my demonstration during the Saturday, June 23, 2 to 4 p.m. "Paris Picnic” event at Prince George Art & Frame on Jamestown Road in Williamsburg. Other gallery artists will be working and demonstrating there as well. An Artful Animal Alphabet features my paintings of favorite animals. This is a hardcover book both children and adults will enjoy because it is a colorful children’s read and also a fun coffee table book for those with a special love of animals. Old Pompey, the last alligator that lived in the lobby of the Jefferson Hotel, is featured in the beginning of my book. 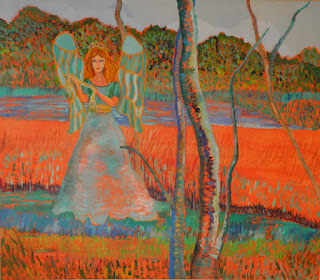 "Angel of the Marshland" is one of my favorite angel paintings of all time, and I've been painting angels forever. 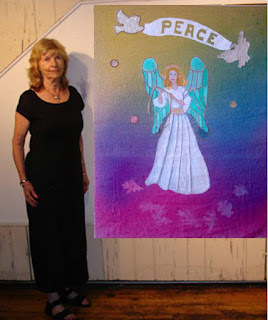 This painting and my Tapestry for Peace project painting were both inspired by Eve Mackintosh, a lovely lady with whom I had a meeting in Denver, Colorado only a few months before her untimely death in 2005. I don't remember exactly how Eve and I connected, but I know it was through the National League of American Pen Women. During a trip my husband and I had planned to the Colorado mountains, Eve and I arranged to meet in the lobby of a hotel located in a Denver suburb . When I first saw her, I felt as if we had always known each other. 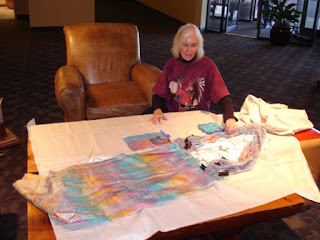 She was vivacious, energetic, and filled with joy about the Tapestry for Peace project she had instigated and that was being sponsored by the Denver Branch NLAPW. The first panel that Eve Mackintosh showed me in our Denver meeting. That day, Eve told me about a vision she had in 1997 while driving along Florida I-10. She saw a gigantic angel in front of her, reaching high with the planet earth in one hand and holding another planet close to her heart. Overcome with wonder, she pulled to the side of the road where she heard the words, "There's a place in space for peace." Eve was uncertain what to do, but she knew in her heart she must do something. She remembered the bloody war scenes depicted by the Grand Bayeux Tapestry of the 1066 Norman Conquest of England. In contrast, she wanted to create a giant peace tapestry that would inspire children to look to the future without thoughts of battle but with dreams of peace. She contacted Masters of Linen in New York City who donated 120 yards of fine linen for the project. When she became an active member of the Denver Branch NLAPW, she shared her story and idea for the tapestry and thus found the help she needed to bring the Tapestry for Peace to fruition. When Eve described her vision, I knew immediately I wanted to be a part of her project. Using a piece of her linen and Robert Doak intense watercolors, I created "Angel of the Earth and Skies" as a contribution from Virginia Pen Women for the project. The angel image is the dominant feature of the art work. Beneath the angel, five oak leaves, representing the earth, float. Three stars,depicting faith, hope, and love, shine in the sky. Above the angel’s head, two doves fly with a banner of peace. The angel holds three golden and silver ties in her hands. These are the ties that could bind the hearts of people all over the world in an atmosphere of love. When the angel left me for its long journey, I missed her and decided to create another angel painting with acrylics on a large canvas. Thus, "Angel of the Marshland" was born. This week, as I began to recall the stories and events that led to these angel paintings, I forgot about the ceramic angel that "posed" for both pieces of art. During a Tuesday night thunderstorm, I was emphatically reminded. That angel is one of three now sitting on a dresser in our bedroom. Every time, thunder sounded and lightning flashed, that angel sounded a little rumbling noise and lit up with light. The other two angels, although they are the ones with batteries and small light bulbs inside them, did not. The ceramic angel spoke to me as she had once before inside a Pennsylvania store where I knew I must purchase her. 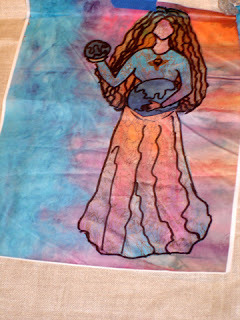 My panel "Angel of the Earth and Skies" is part of the 264-foot long "Tapestry for Peace". 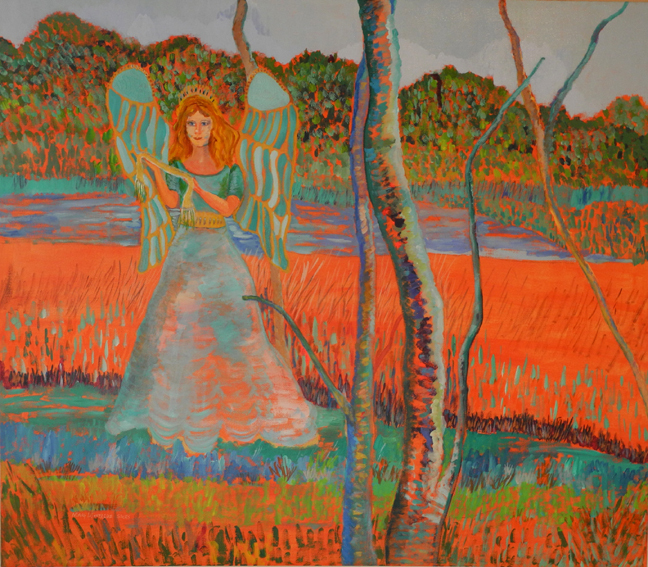 "Angel of the Marshland" is on view now at Dara LeBlanc Haynes' Mathews Country Galleria. The ceramic angel stands ready to pose for yet another painting. The new painting will probably be "Angel of the Trees" because I look out into our woods and wonder where angels might hide. Our nation and our world is in dire need for peace. Perhaps the Tapestry for Peace will one day come out of storage and travel the world inspiring the children. That is what Eve Mackintosh planned all those years ago. Over the years, I have taught art to students at every age level from pre-school to older adults. I love witnessing their creativity and excitement over their accomplishments. I especially like seeing the joy that art brings into their lives. For older people, creativity provides a goal, a reason to get up in the morning and go out to an art class or head to an easel or art wall inside their own homes. The creative activity can take the form of painting, sculpture, pottery, jewelry and more. Crocheting and knitting are art-crafting endeavors enjoyed by people of all ages, especially older ones. Some studies show that crafting provides a large benefit but not quite as much as painting. My mother loved to crochet. She would sit for hours crocheting colorful pieces that she later put together in afghans to give as gifts. Although she did not grow up in a time when physical fitness was stressed as it now is, she kept her brain healthy with the bright strands of yarn dancing on her needle. Because people are living longer, the 85-plus age is a fast-growing population segment. It's a group of people who can be inspired because of creative potential or they can be led into depression by those who do not understand their needs for purpose in life. If people are encouraged to take more art classes and more art workshops, I believe they will be happier. They will have less reason for depression. They will need fewer drugs. 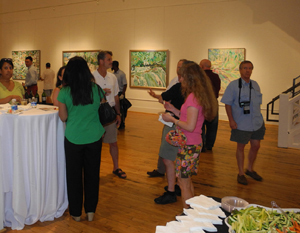 Open House, Friday August 14, 6 to 9 p.m.
Two large seascapes in this show were created from photographs taken by the artist as a hurricane approached a beach in the Bahamas. Other works developed from pictures captured in Jamaica, Antigua, Trinidad, Barbados, and Hawaii. "Dunn's River Falls" features the water cascading over falls rocks during visits to Jamaica. An earlier painting created of the falls became part of a collection of art purchased by the Marriott Hotel in downtown Richmond when it first opened. Waterfalls in Kauai are the subject of a smaller painting in the show. Please check with me at monti7olen@verizon.net for information about upcoming workshops I'm teaching in September. I have a three-day workshop, "Painting Like Georgia", at the Art Academy of Hilton Head Island SC. I also have a three-day workshop, "Painting with Texture and Design", in Hilton Head. 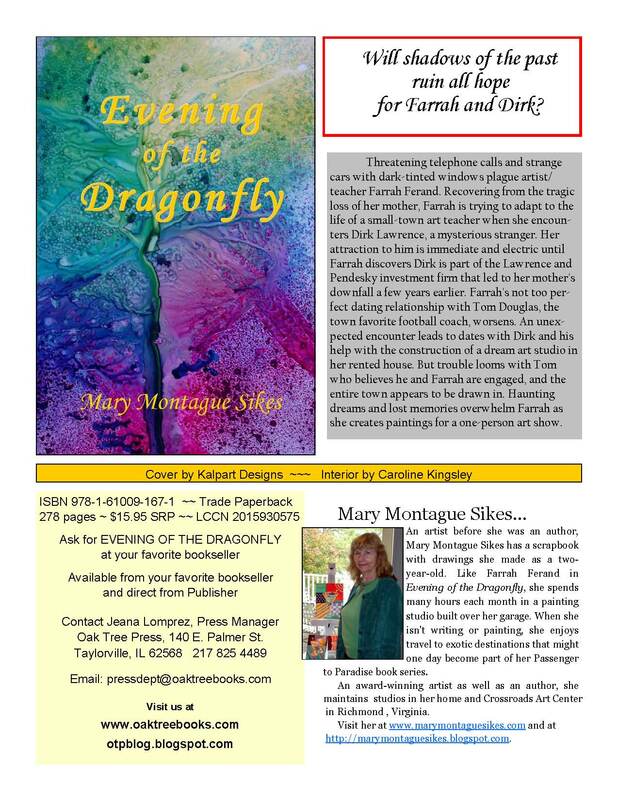 Farrah Ferand, the heroine of my new novel, Evening of the Dragonfly, has come alive in an unusual way. The book character has a series of original paintings in an invitational art exhibition at Arts Alive, opening on September 15. 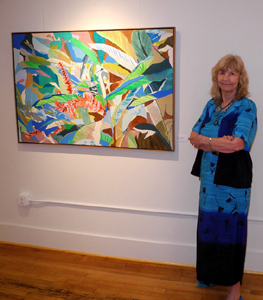 Among the works is a painting called "Moonshine" relating to tales her mother and her grandfather told Farrah about relatives making and selling moonshine in the back woods of western Virginia. Several paintings in the show evolved from Farrah's dreams that are featured in the novel. "Farrah's Dream" is a painting about one of those dreams. When Farrah sees a dragonfly or groups of them, she feels optimism. Although the pretty flying insects seem connected to the death of her grandfather and then the death of her mother, she believes sighting the dragonflies is like seeing the spirits of her departed loved ones. These symbols are depicted in the painting, "Optimism". 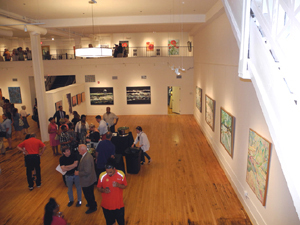 The opening reception will be Saturday, Sept. 19, 6 to 7 p.m. at the W.T. Robinson/Sture G. Olsson Civic Auditorium and Fine Arts Center in West Point.